Deciding on your centerpieces and table decorations can be a really tough job - there are so many options to choose from and so many things to consider! I thought I'd pop together this quite guide to dressing your tables - hopefully it will be helpful! * If your tables are round, as most venues are, height is important. Tall centerpieces like candelabra work well because guests can still see everyone around the table. Glass also works well - hurricane vases are simple but beautiful. Try to avoid a solid, wide and tall centrepiece which your guests are going to have to peep around. * How much do you want to spend? The sky is the limit when it comes to everything with weddings, so think about your budget. Fresh flowers are beautiful but can be expensive, especially if you have a lot of tables. These things add up so quickly! Our centerpieces start from just £7.50 each for a simple lantern on a mirror base, with votive candles and scatter crystals. Simple but effective and definitely budget friendly. * If you have a colour theme running throughout your wedding you may want to incorporate this into your table decorations. Subtle colour tends to work best. Table runners can look great, especially without too many other decorations. Simple additions such as ribbons on your napkins can work better than blocks of colour - such as coloured napkins. Adding a ribbon band around a church candle or pretty coloured scatter crystals are simple but really work. Tie everything in with your chair cover sashes for a really beautiful look. * Table numbers are often over looked. They are something that all your guests will need to look at, and it doesn't have to cost a lot to keep your theme running. If you're making your own table names or numbers keep them small - around A6 is ideal. Most venues provide silver stands which your numbers or names slot into - we have these available for hire if your venue doesnt provide them. We also have gorgeous vintage style chalk boards and painted wooden numbers should you wish to hire them. 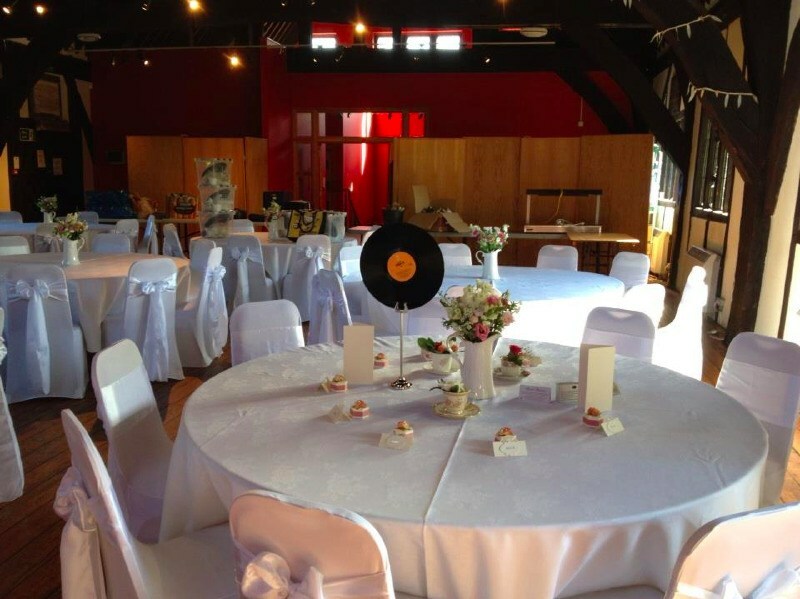 We also loved these quirky record table numbers which one of our clever couples provided. * Dont forget about all the things that will be on your tables. On a round table this will generally include centrepiece, glass wear (at least two glasses per person), wine, cutlery, side plates, napkins, table number, place cards, menus, and favours. That's a lot of stuff for quite a small space - try to avoid your tables looking too cluttered by choosing centerpieces that don't take up too much space or spread out too much. 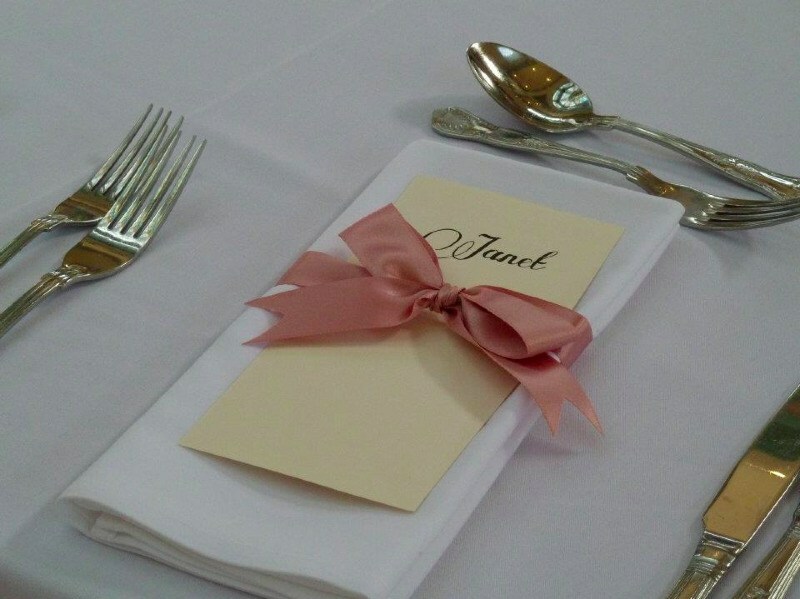 Folding your napkins, and incorporating ribbons and the name tag (as above) can really work too. * Candles look great - they add to the atmosphere and are fantastic at night too when the lights are dimmed. Make sure your venue is happy for you to use candles, and be careful with open flames. Our votive candle holders make sure that the flame is safe and enclosed. Try to avoid tea light holders where the flame will be a risk to anyone passing wine across the table or knocking over a menu. * Petals, crystals, personalised paper confetti - all look great. One of our weddings even had love heart sweets scattered on the tables which looked amazing! Just make sure that your venue is happy for you to use them, and if you use petals make sure that if they are coloured they are colour fast. * Don't worry too much about matching up your colours exactly. Even the same colour looks different in different fabrics, and having complimentary shades gives a more organic, natural look to your room. Its easy to get stressed about everything been an exact match, so instead just make sure each element looks good together - it doesnt have to be the same. We can provide samples of our sash fabrics, ribbons and flowers for you to make sure that everything works well together. * Don't be afraid to add a personal touch! Its your wedding - don't shy away from adding things that represent important areas and passions in your life. One of the most beautiful, classic weddings I ever saw had their tables named after Heavyweight Boxing champions. It's your day! Make it personal. Our centrepiece hire prices start from just £7.50 each, and all elements are also available to hire individually.